Ok, I'm not officially back. But I did want to post. Just a little FYI for the ladies in Canada that don't live near a Sally Beauty, Winners is selling China Glaze's Up Up and Away collection for $5.99 each. When I was there today, they were literally just putting them out. So keep an eye out! And Sally's is indeed upping the price of China Glazes for members. They are now $5.49 (if I remember correctly) instead of $3.99. *Super sad marmot* Oh, and for anyone who's wondering. I'm 98% better. I've just got a sad and pathetic orphan cough now. 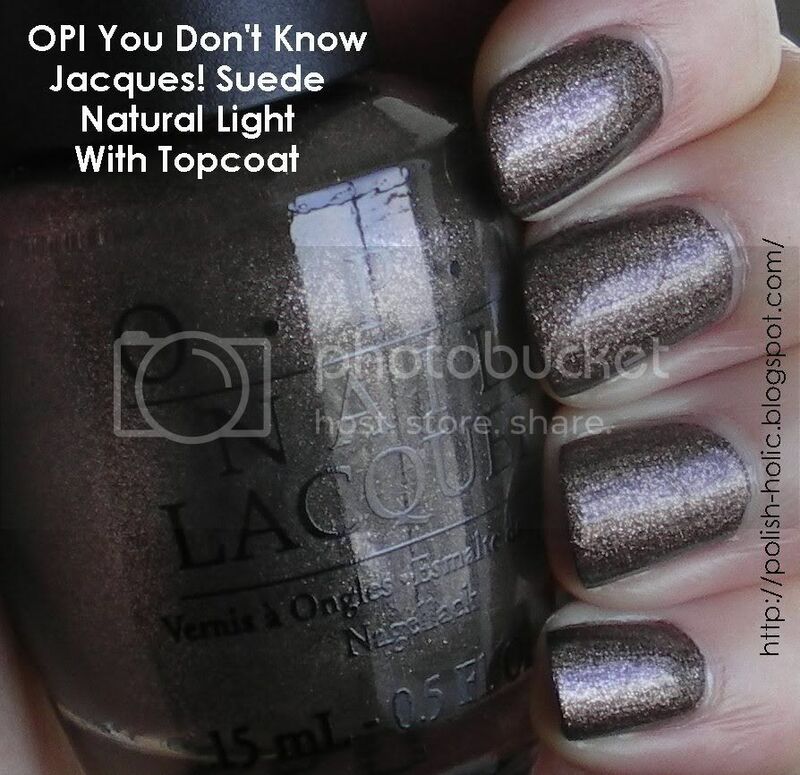 Jacques suede is a brown matte polish with silver shimmer. It's brown and blingy. Me likes, me likes a whole lot. And I also went and slapped a top coat on it. So check it out! This is two coats. You could probably get away with one if you're careful. Like all mattes, highly pigmented. But always wear base coat. This little buddy totally stained my nails. It's the only time I've ever gone naked underneath and I'm never doing it again. Edit: Tomorrow is the last day to enter my contest. So get your entries in! Oh, that's gorgeous! Glad to hear you're feeling better. Thankya dear. And I really love it. 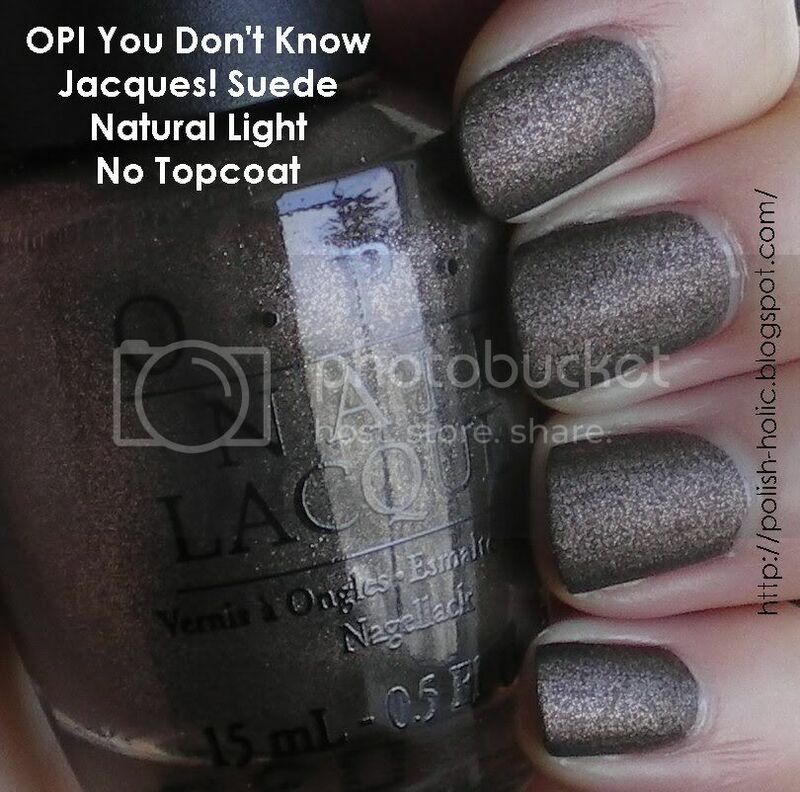 OPI did good when they came out with the Suedes. i love all the collection suede !! Lily nail: I know eh? 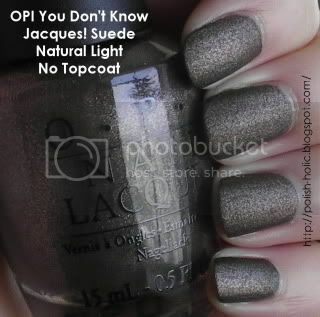 Who would have ever thought adding silver shimmer to matte polish would look so good. Susie: Brown never looked so perdy. WizardsOfBling: I get that. You totally get a rush when you find something you've been after. SeeingSunshine: Oh really, I didn't realize it'd be so hard to get. Halifax: Yes, the price used to be much better at Sally's. It's really too bad that they upped the price that much more. smALtY: That's really too bad. I just about squealed like a dork when I saw it out. 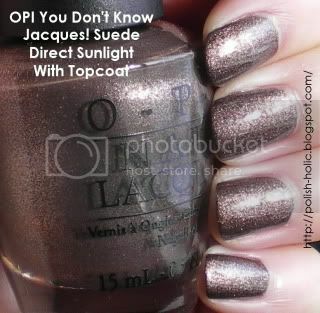 Really pretty, especially like it with the top coat. Give me your email on your entry for the giveaway! 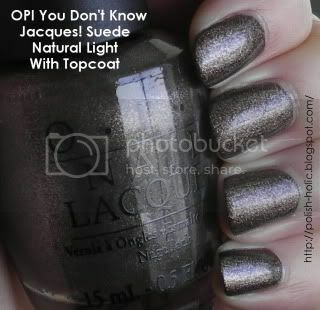 I really quite like the Jacques matte, but would just end up putting a glossy top coat on it. I actually don't own any mattes - is it true you can't use hand lotion becasue it messes up the finish? By the way: Sally's does have China Glaze on sale for March at two for 10$ - which sadly is still more expensive than before. You can use lotion just fine. It makes it satiny for a bit, but it's not a huge deal. And I think the deal is 2 for $8. Tooootally taking advantage of that. And thanks, darlin'.